big name player, that is why David is available at very affordable rates. 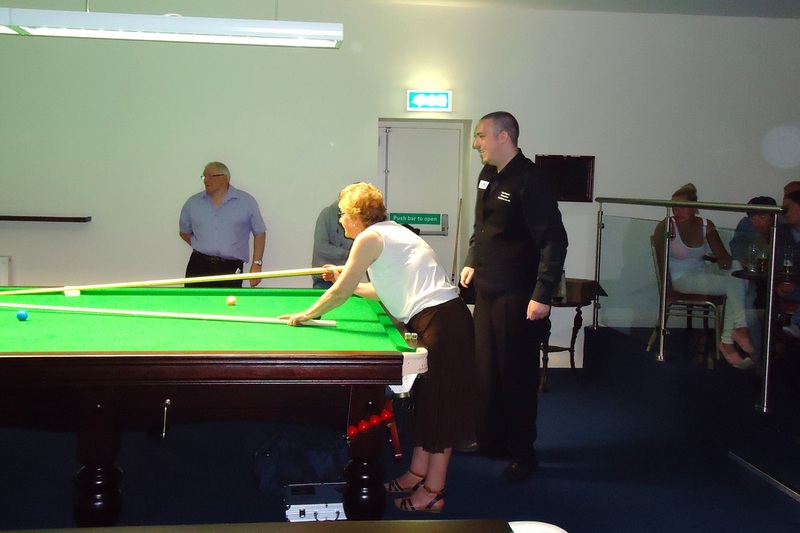 Exhibition Evenings are a great way to bring in extra customers and advertise your snooker facilties. They are ideal for end of season presentation nights, event launches, or club openings. Once the booking is confirmed, we will send you a set of A4 posters for you to display in your club to advertise the event. David will come to your club and play up to 8 local players one frame each. We will provide a set of match balls for the evening, and each club will receive a free framed photo montage to commemorate the exhibition. Please Contact Us for prices and to book. Snooker is a sport exploding in popularity around the world, and a snooker exhibition is an exciting way to showcase your business to clients, or just to reward your hard working employees! Corporate Events can be arranged at a suitable snooker venue close to your business, and once the booking is confirmed we can send a set of A4 posters to help you advertise the event. David will play up to 8 frames against players of your choosing, or if none of your clients/employees have any snooker experience we can provide an opponent for him to play. After the exhibition you will receive a framed photo montage to commemorate the event. All corporate events can be tailored to suit your company's needs, and costs a fraction of what a Golf day or Football Hospitality would. Please Contact Us for prices and to book.